If you asked me about what I could think of SunPride, I would definitely say Banana. Yes, I was a fan of SunPride's Banana. But it was in the past. Now I know that SunPride is all about fruits! Woho! I am so happy, because fruits are my favorite food! It starts from my yoga client that owns a public relation company called Kennedy Voice and Berliner that suggests that a media visit by its client, SunPride Indonesia, should be different from the ordinary media visit. As she loves yoga and yoga is always connected to a healthy lifestyles, then an idea of having a media visit with a yoga practice comes up! Just a brilliant idea! Both yoga and fruits are the doors to healthy lifestyle, and that there is a practice of eating raw food in yoga world where we only eat raw food like fruits for several days. Yoga and fruits are like body and soul! Perfect match! 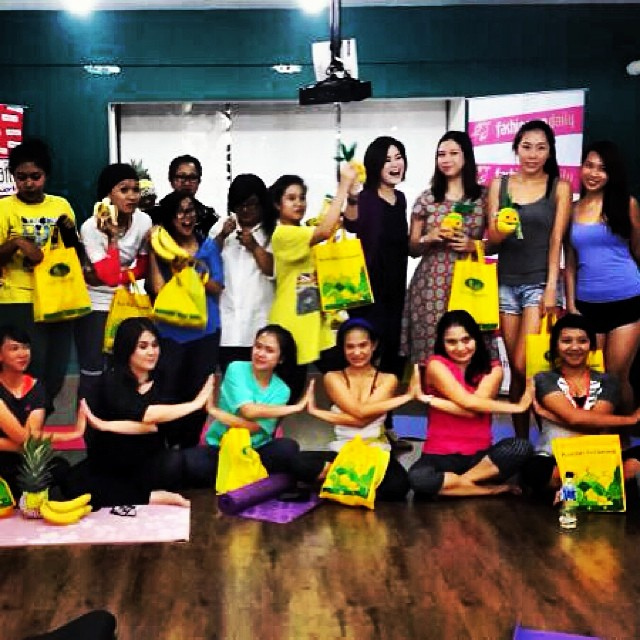 So, I have fun teaching yoga at the media visit by SunPride called SunPride Fruitaholic Yoga event to MRA Media Group, Female Daily Network and Femina Group. The second yoga event with Female Daily Network is about opening both the Fourth Chakra (Anahata Chakra) and the Third Chakra (Solar Plexus or Manipura Chakra). At this yoga practice, I share the knowledge of loving the inner-self first before loving others and stabilizing the emotion of the inner-self to give us the confidence to choose which things in our life that deserve our loves more. Most of the participants are familiar with yoga, so it is easy for me to teach them the yoga I know. Again, it is a happy yoga event. 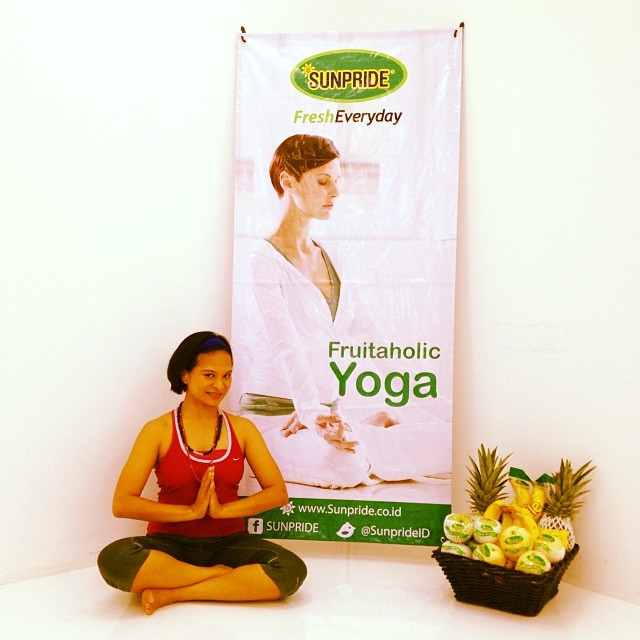 At all yoga events, SunPride placed a desk of fruits where we can eat all the fruits they have! That is where I find out that SunPride is all about fruits, not just Banana. LOL! I can find apple, pear, guava, papaya, melon, pineapple, orange, kiwi, and many more! And what surprises me is that SunPride has their own plantations in some cities in Indonesia. So yes, most of the fruits by SunPride grow in the rich land of Indonesia. So proud to know that! While eating the all yummy healthy fruits, I read some of the fun facts about fruits that are shared by SunPride. So, let me share about them. Don't worry if we see the black dots on the skin of a banana. It is a sign that the banana has sugar spots that can combat cancer and contains Tumor Necrosis Factor that can increase the blood system and rejuvenate our body. It can help those who want to stop smoking as it contains vitamin B and minerals that combat the stress caused by the stopping of consumption of niccotine. Melon contains vitamin A, E, C, and K that can take away dead skin cell, enlighten skin and protect our skin from UV lights. It is just a great antioxidant! It is also good for curing cancer, increasing digestion, reducing heart disease & stroke, healing common cold. It also has mineral and calcium that support the growth of teeth and bones in the babies. Papaya contains vitamin A, C, folat & pottasium. It is good for our skin, immune system, heart, fertility, digestion and can reduce the risk of cancer. It is good for those who are on a diet as it almost has no calories, fat and cholesterol. It is an anti inflammation to reduce the pain in our joints, to heal the wounds and good for our blood. By applying it on our skin, it can reduce acnes and wrinkles. Apple is good for combating cholesterol, asthma and diabetes. It can be used as a face mask to reduce wrinkles. Orange contains vitamin C that can enlighten our skin, increase our immune system, reduce the risk of lung cancer, heal irritation on our mouth and influenza. Its potassium can help to lower down the cholesterol and blood pressure. It is a stress reliever too. Kiwi is good for our digestion, healing the diabetes, and increase the growth of good cells in our body. In my own personal opinion, I love fruits as they help me to stabilize my weight and control my hunger. Fruits also perfect for me as I don't have to cook them and their taste is so nice as they are naturally sweet! The latest experience I get is that fruits are good for increasing my stamina and endurance when I practice running. Thank you, SunPride Indonesia and Kennedy Voice and Berliner for giving me the chance to share the goodness and the love of yoga to your partners and sharing the sweetness of the fruits from your plantation. The fruits are totally the gifts from heaven!